Pre- and post-money valuation is what you need when startups and VC sit down to talk. 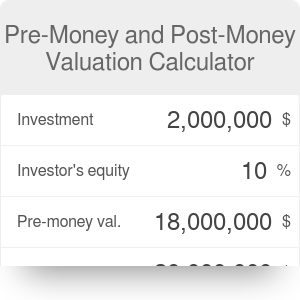 Post and pre-money valuation calculator does simple math to free your mind to do more important things when you negotiate your startup's valuation. It does not answer the question "how much is my startup worth" in its general understanding (based on how much revenue, traction, margins or whether it breaks even). Instead, it does a multi-directional math providing any two values from the set of investment amount, investor's equity, pre-money and post money valuation to get the remaining two values. Typical scenario: a startup accelerator invests $25,000 for 5% stake in the company. The calculator will tell you that this startup's valuation was $475k pre-money and is $500k post-money. Interested in various methods of company valuation? Check out the discounted cash flow calculator! The difference is rather simple - pre-money valuation is how much the company is worth before the investment flows into the startup. Post-money valuation is how much a startup is worth after the money enters the company. Example: a startup that lets you store goat pictures in the cloud is valued at $10 million (pre-money). The ACME Venture Capital invested $2.5 million in a series A round. Now the company has whatever it had that was worth $10MM plus it has that $2.5MM in cash, it's worth $12.5 millions. $2.5 is 20% of $12.5, so ACME now has 20% of the company. On a separate note, these are some tools you may be interested in: online marketing conversion and website ad revenue calculators. Pre-Money and Post-Money Valuation Calculator can be embedded on your website to enrich the content you wrote and make it easier for your visitors to understand your message.